Equinox Gold Corp. (TSX-V: EQX, OTC: LWLCF) (“Equinox Gold” or “the Company”) is pleased to announce positive drilling results from near-mine exploration at the Company’s 100%-owned Aurizona Gold Mine (“Aurizona”) in Brazil. Broad intervals of economic grade gold mineralization, including ultra high-grade gold values up to 1,005 grams per tonne gold (“g/t Au”), were intersected near surface at the Genipapo, Micote and Mestre Chico targets. The Company tested six near-mine exploration targets with 45 holes totalling 5,500 metres (“m”). 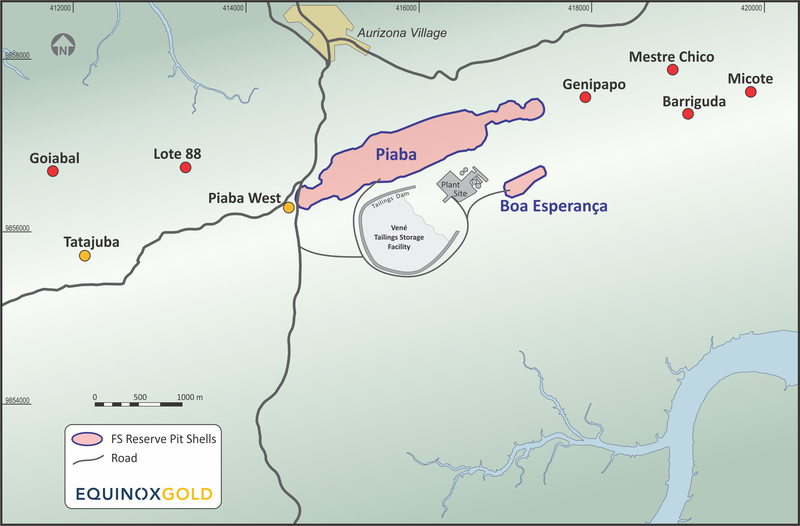 The Genipapo target, located east and north of the Piaba gold deposit, measures several square kilometres in area and covers numerous NW-SE trending gold-in-soil and geophysical anomalies. Drilling focused on the largest gold-in-soil anomaly, measuring 500 m by 1,000 m, and has now intersected gold mineralization on three distinct structures within a 400 m wide corridor. The NW-SE orientation of these mineralized structures is new and unique to this portion of the Piaba trend. Drilling at Micote, located several kilometres to the east along trend from Piaba, successfully tested a typical ENE-SSW trending structure over a strike length of 200 m before being truncated by a NW-SE trending fault. Recent mapping and historical drilling suggest that the zone might be displaced approximately 100 m to the NW. Of note, drilling returned two ultra high-grade gold assays of 1,005 g/t Au and 735 g/t Au from within a broader zone of 84.3 g/t Au over 21.0 m. Exploration composites are calculated on uncapped assay values. The samples are from the saprolite zone where surficial processes can significantly enrich gold content. Applying the 40 g/t Au cap that was used for saprolitic material in the Piaba resource estimate would change the interval to 5.29 g/t Au over 21.0 m.
Drilling at the Mestre Chico target was limited to an area measuring 100 m by 100 m. The target is associated with a NNE-SSW shear zone where several structures converge forming a complex fault system associated with rare felsic plutonic rocks. The exploration team at Aurizona is currently focused on updating geologic models and refining plans for future drill campaigns, including a first pass drill program at the Tatajuba target that the Company plans to commence in the second half of 2018. This document contains certain forward-looking information and forward-looking statements within the meaning of applicable securities legislation (collectively “forward-looking statements”). The use of the words “will”, “currently”, “updating”, “objective”, “underway”, “continues”, “potential”, “intends” and similar expressions are intended to identify forward-looking statements. Forward-looking statements contained in this news release include, but are not limited to, statements regarding the exploration strategy and potential at Aurizona, production potential from the Aurizona Gold Mine and Castle Mountain Gold Mine, the Castle Mountain prefeasibility study, the potential for other assets of the Company, and the long-term growth potential of the Company. Although the Company believes that the expectations reflected in such forward-looking statements and/or information are reasonable, undue reliance should not be placed on forward-looking statements since the Company can give no assurance that such expectations will prove to be correct. These statements involve known and unknown risks, uncertainties and other factors that may cause actual results or events to differ materially from those anticipated in such forward-looking statements, including the risks, uncertainties and other factors identified in the Company’s periodic filings with Canadian securities regulators, and assumptions made with regard to the Company’s exploration strategy at Aurizona; the results of Aurizona exploration and the impact of Aurizona exploration; the Company’s ability to complete the Castle Mountain prefeasibility study and the results of the study; the Company’s ability to complete construction at Aurizona and the timing to achieve production; and the Company’s ability to achieve its expected growth and production potential. Furthermore, the forward-looking statements contained in this news release are made as at the date of this news release and the Company does not undertake any obligations to publicly update and/or revise any of the included forward-looking statements, whether as a result of additional information, future events and/or otherwise, except as may be required by applicable securities laws.